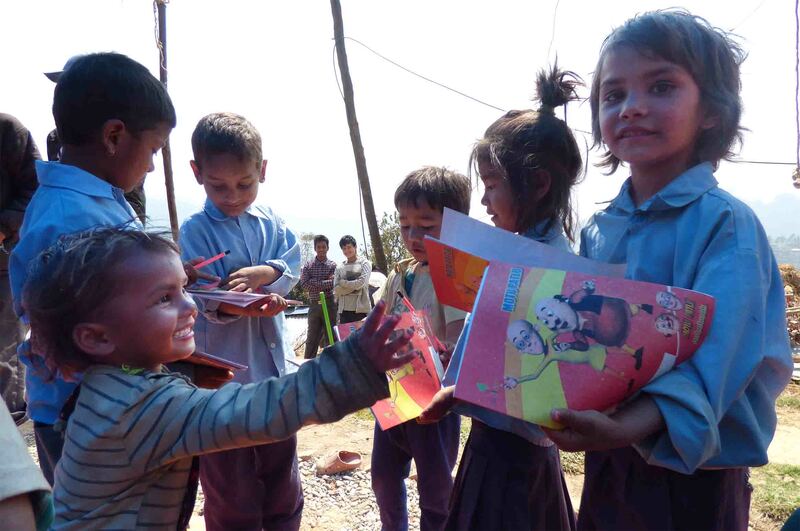 On 19th March 2018, NJSI handed over Shree Saatkanya Early Childhood Development (ECD) center to Saat Kanya School located at Balephi -06, Sindhupalchowk. The center was built with the sponsorship from Xavier Network. Currently, it benefits twenty six children (twelve boys and fourteen girls) under the supervision of one facilitator, Ms. Uma Paudel. The center will also be used as women activity center. The inauguration ceremony was attended by the regional superior of Nepal Jesuit Society, Fr. Amrit Rai S.J., the director of Nepal Jesuit Social Institute, Fr. Roy Sebastian S.J., NJSI community Superior, Fr. Arulandam S.J., secretary of Jesuit in Social Action, South Asian Assistancy, Fr. 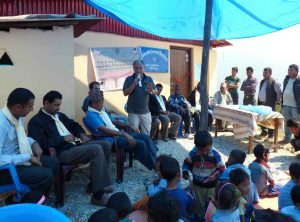 Stanislaus Jebamalai S.J., chairperson of Balephi ward 6, Mr. Chitra Bahadur Tamang and 65 villagers. The local participants were appreciative towards NJSI’s approach to enhance village’s children’s education and they anticipate further support. They also presented a letter of appreciation for NJSI’s contribution. NJSI is thankful for Mr. Yamnath Paudel for providing his hand to construct the building. 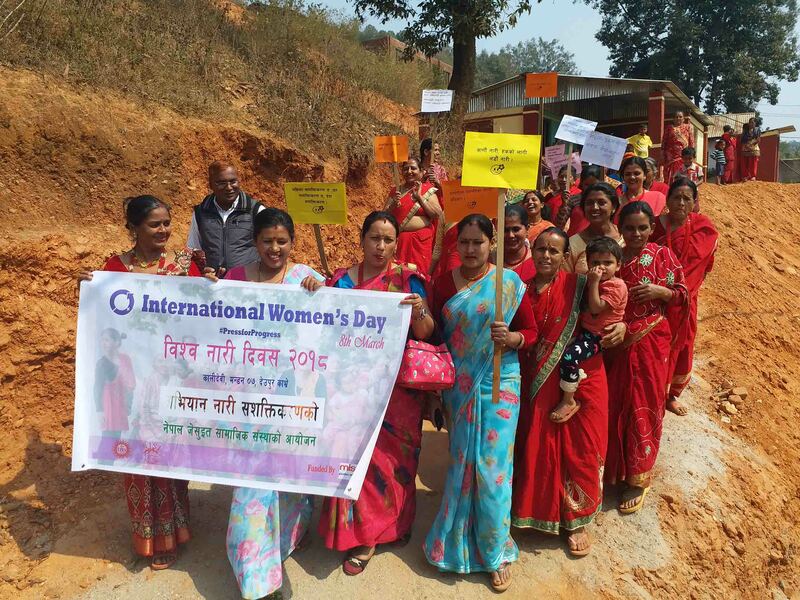 International Women’s Day Celebration at Jaretar, Kavre was incorporated with the celebration of completion of tailoring training. 16 Danuwar women had completed three months long basic tailoring training. Altogether 27 women participated in the program along with their children. The program started with visual presentation of women icons of Nepal, speeches from women’s group, songs, dances, quiz session and certificate distribution. The group actively made a march around neighbourhood chanting slogans of women empowerment. International Women’s Day celebration in all 4 places fortified the notion that abilities are not stratified based on someone’s gender. It is just social construction that have led men to be a “better” gender. NJSI will continue to dismantle such stigmas by creating opportunities for women to utilize and outshine their potential, and prove themselves. We thank all the donors who have supported in this mission and express special thanks to Misio Achen for sponsoring International Women’s Day program themed “the Campaign for Women Empowerment” in all the places. “In this life, no one knows how a daughter dies. Where is the so called justice when a pregnant lady is abused? No one sees the burning soul within. Celebration at Kalidevi had the largest number of people (91) gathered to cheer for gender equality. Almost all of the participants were from Kalidevi Women’s Group; only two participants were male: village’s chairperson and an agricultural trainer. This group is one of the strongest women’s group we have supervised. They have shown strong sense of unity among themselves and drive to work for women empowerment. They attended the program despite of their need to be at the farm sowing potatoes. After the women’s day march, they reflected on each slogan written on boards and women icons presented by NJSI staff. We had conducted an activity session in all the places whose motive was to make them realize importance of communication, equality, leadership and unity. Second part of the session involved asking them what they would do if they were the ruler of the world; most said that they wanted to make the world a just place. The program adjourned with folk songs and dances, and happy faces returning home with determination to step up for equality. 108th International Women’s Day Celebration 2018 in Khadichaur, Sindhupalchowk was another attraction with crowd of more than 80 women, men, young girls and boys and children. The event was conducted at Bal Shikshya Higher Secondary School. The group wisely used depiction of culture and arts to spread awareness about basic fact that men and women stand equal. Also, the program included visual presentation of female icons of Nepal who have proven themselves against the odds. We have a women’s group at Khadichaur who has been using women activity center facility for regular meetings and other events. Their enthusiastic disposition to advance in gender mainstreaming have inspired us to relentlessly work to support them. If given opportunities, they can be the best in everything. Gender mainstreaming in socioeconomic reformation has been a crucial focus of NJSI. 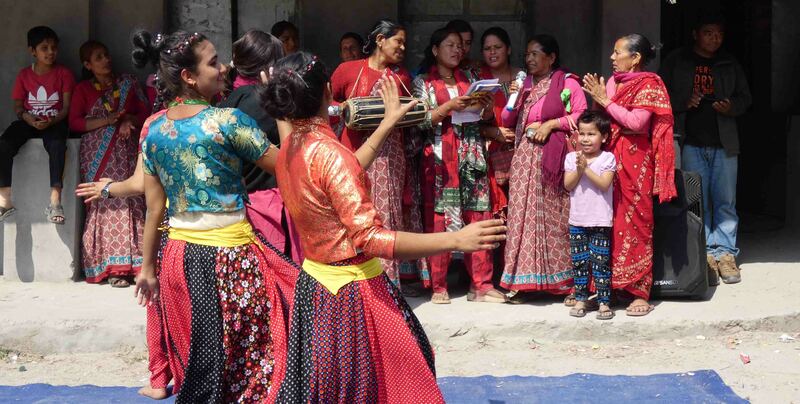 NJSI has contributed construction of 8 women activity centers in 6 districts of Nepal. The centers are used to conduct various livelihood enhancement projects and, women empowerment trainings and workshops. To celebrate gender quality, we had International Women’s Day programs with local women of 4 different places: Kalidevi, Khadichaur, Jaretar and Rakathum. These programs were sponsored by Misio Achen. All of the places had engaging and enthusiastic participation. 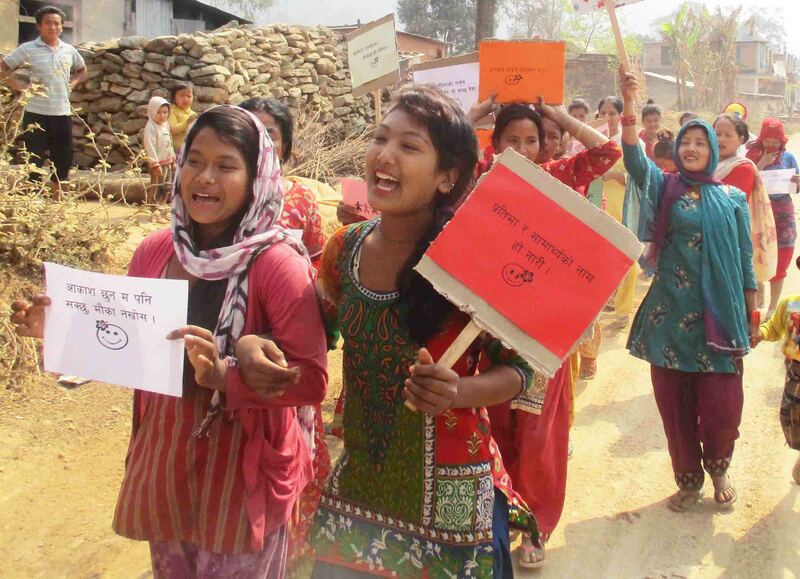 Celebration in Rakathum, Ramechhap was a success with 61 adult participation and more than 20 children raising placards decorated with empowering quotes. The event bloomed with many dances, songs and poems composed by the participants themselves. Songs and poems depicted heavy inequality issues, power of women and their contribution to the nation. “WELCOME, WELCOME, WELCOME, we welcome everyone. Suri is one of the remote villages of Dolakha district. 99% and 97% of the households still depend on firewood for cooking and lightening respectively. Similarly 31% of household do not have toilet (Government of Nepal, National Planning Commission Secretariat 2014). These issues contribute to gradual environmental degradation. 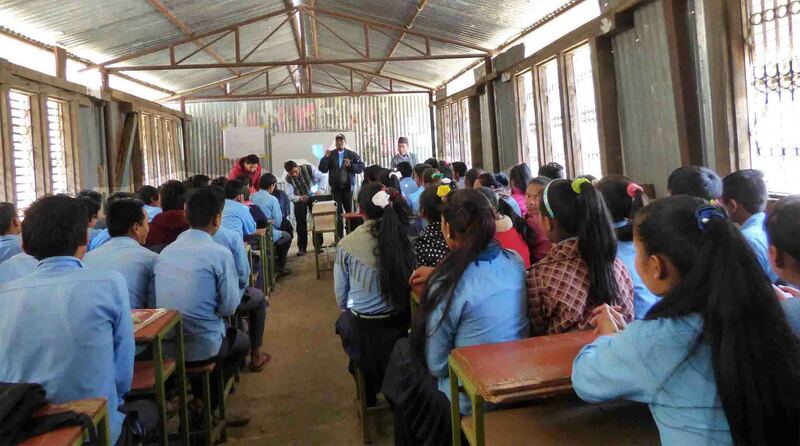 As a part of our scheme to promote environmental health, NJSI recently formed an Eco club in Haleshwor Secondary school in Suri Dolakha on 2nd March, 2018. This is the first Eco club established under the supervision of NJSI. We presented about the importance of environment and its conservation. As it was the first meeting, the club executive board members were elected from among 69 students of grade 8 and 9. The club was subdivided into six divisions for smooth operation implementation, each focusing on cleanliness and hygiene, plantation, recycling/reuse, fund raising, media, and documentation respectively. Students have already planned to have a plantation program around the vicinity of the school. They are also determined to work to make the school a polythene bag free zone in near future. We also conducted an ECD training for teachers of Haleshwor School, similar to the one conducted at Sindhupalchowk on 23rd of February.